Zones are the basic monitoring elements. Currently the only zones present are the ones that are hardwired on the main board. There are physically present 7 analog zones and 4 digital ones. As you can see on the picture there is table that represents the overview of all the zones and their statuses. The future is open for at least three possibilities that I have prepared already. One is to use shield that communicate over TWI interface. This can be either analog multi channel ADC for analog inputs or TWI port expander for digital inputs. Other would be remote zones tied to remote boards. These board are equipped with extension header to easily break out the SPI, TWI, analog or digital pins. This would also simplify wiring of the distant zones. For now I'm planning to make the second option available. Third would be radio controlled zone, or radio controlled remote board. But current stage is just the hardwired zones. 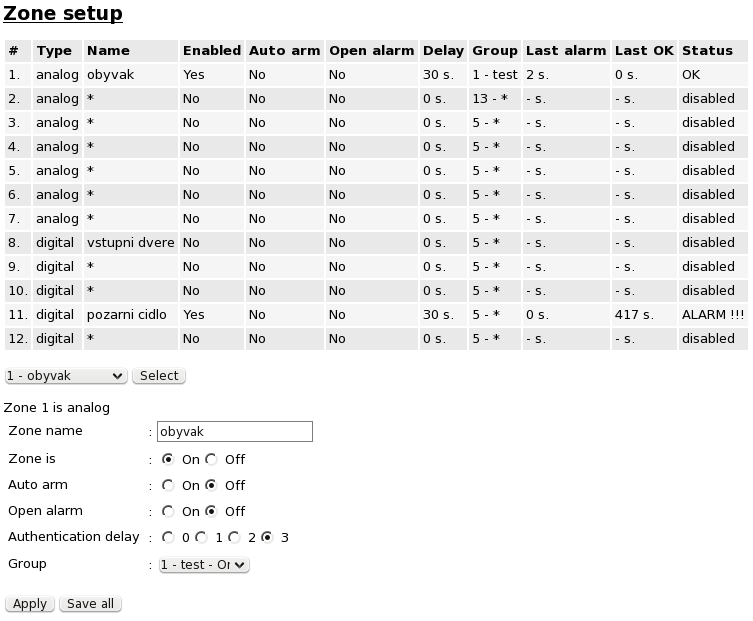 And the configuration in web interface is as follows. There is zone number witch represent the port on the board and also type of zone. Then there is a zone name which a user can modify and can span over 15 characters. This name is than used when sending SMS messages or is used when reading log over web interface to better represent it then just the zone number. Next is the switch that is turning the zone "On" or "Off" and it does exactly this. Auto arm is telling the system to set the zone to arm status when there is no movement in the zone for specified amount of time. I will use this for garage that is attached next to our house. Next switch is open alarm, that does the opposite. It monitors the zone and when it is open for longer then specified time, it issues a message in log and sends out a SMS. It is intended more for digital zones, such as door switch, and allows the system to let you know that you forgot to close them. Again a garage door is a good example, if you forget to close it and you are already in house, system will notify you. Authentication delay switch is telling the system, how long it should wait for the authentication if the zone is tripped. This let you easily adjust the timing mechanism of alarm. For example if some one triggers the zone in you front door, you can set the authentication time high. Because you can assume that it is normal pathway. On the other hand if someone trips the zone in your bedroom that has only window, you can set the authentication time to zero. Because you would normally not enter your house through bedroom window(too much beer probably, when yours wife is in her sister). The switch multiply the time set in authentication delay parameter present in global setting. The last option for a group is to select its superior group. This option telling the system what zones are treated as one area. And when one zone is armed it arms all zones in group.